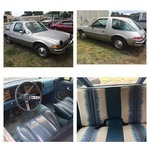 Up for sale is a 76 PACER DL in great shape! Runs and drives. Does need a tune up though to be completely road reliable. 3 on the tree manual. No rotten rusted panels. Mostly complete car minus the badge on the front grill. Body is straight no major dents or dings. All glass is present and not cracked or broken. Approximately 78k mi on the odo. Silver with blue interior, interior is in great shape, seats in great shape! Will get pics up ASAP. Message me for quicker pics and more info. I'm currently in Shreveport, LA but moving soon to Colorado Springs, CO. Looking to get $4k or best offer. Please no low-ballers. My email is onescruluse at gmail .com and my cell is 318-780-nine nine one six. Use these for faster responses! Thanks! Forgot to mention that I have a clean and clear title in my name. Ready to go! Are you bringing the Pacer to colorado springs by any chance? I can. Only in LA long enough to have transmission work done on my landcruiser. Should be done this next week. I was about to put it on CO Springs Craigslist. If there's any real interest in the car, I'll bring it with me. If none, it'll stay here in LA for a bit longer. Interested? I can send more pics and prob a vid of it running and driving if needed. I'll see if I can. Need to see how much I can spend for a car. I have pics and a few vids of the car running and driving, let's make a deal!!! Shipping to most places in the US is somewhere between $600-$1k. I will accommodate that into my selling price. Please don't let that deter you. Do you still have this car for sale? Yes it is still for sale.